ANYWAY. Then I was going to come home and post them on the blog and tell you how fun or stressful or crazy it was. And how it’s impossible to get two small children to look at the camera and smile at the same time. (That’s just a fact of life.) But all day rain and no pictures instead. 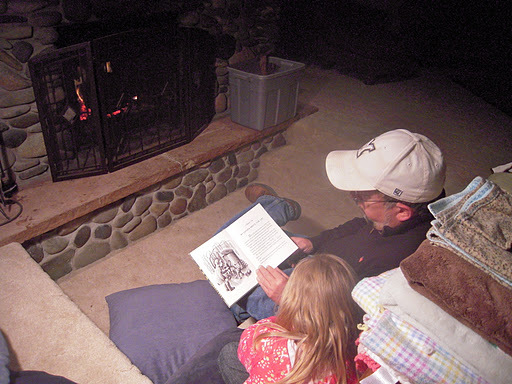 Bedtime stories with grandpa in front of the fire. Does it get any better? Maybe instead of trying to get your kids to look at the camera you should try some candid shots. Like all of you walking and holding hands, or your kids playing in the leaves, or you all just sitting and laughing together. Those pictures always turn out super cute. Good luck!